Independent Healthcare Properties and Morning Pointe Senior Living were well represented at the Christmas on Cambridge Square 5K Glow Run, the 16th annual Kiwanis Club of Ooltewah-Collegedale Run/Walk. 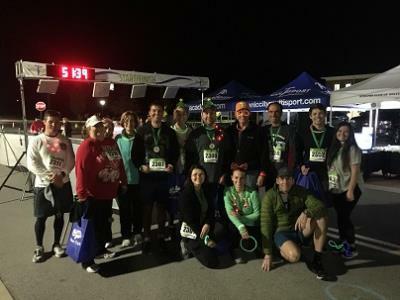 Over a dozen Morning Pointe Senior Living associates, armed with glow sticks and Christmas sweaters, participated in the night run under the name “Team Morning Pointe,” with five associates placing first in their respective age categories. Brien Applewhite, secretary for the Kiwanis Club of Ooltewah-Collegedale and senior vice president of Asset Management at Morning Pointe, estimates that the race raised over $8,000 for District 9 – The Ooltewah Harrison Education Foundation, which provides support to the elementary, middle and high schools in the Ooltewah and Harrison area. “We are excited about the support the Morning Pointe team brought to the event and hope everyone enjoyed it,” Mr. Applewhite said. “The 5K was a great way to support our local community, give back, and invest in local education,” said Summer Blizzard, director of Business Optimization at Morning Pointe and chief organizer of Team Morning Pointe. For Ms. Blizzard, organizing the team was part of what she called her personal “passion project: promoting teambuilding and boosting morale by creating fun and unique opportunities for associates to lead active lifestyles." Team Morning Pointe’s participation in the Christmas on Cambridge Square 5K Glow Run also reflects a growing initiative at Independent Healthcare Properties and Morning Pointe Senior Living to encourage associates to pursue physical fitness. “A person’s physical health affects all aspects of their life. When our associates are able to take their minds off of work, engage their bodies in positive and healthy physical activity, and connect with their community, it ultimately makes them better able to serve our seniors,” said Greg A. Vital, president and CEO of Independent Healthcare Properties and Morning Pointe Senior Living.